The festival of colours spreads happiness and vibrancy all over the world when it arrives. Indians across the world wait for Holi, for days to skip past the monotonous schedule and fill the lives up with colours and joy. In 2019, Holi would fall on 20th March, Wednesday. This festival is celebrated throughout India and by Indians across the world. However, two places in India are best known for its grand celebrations. People from all across the globe visit Mathura and Vridnavan to witness this spectacular celebration. Mathura and Vrindavan – Special Grandeur on Holi – Why? Holi is celebrated in a magnificent way in these two places and to know the reason behind it, we must take a look into the history of this festival. Mathura is considered to be the birthplace of Sri Krishna. It is said that when Sri Krishna was young he once went to his mother, Yasoda Maa, with the complaint of being dusky while Radha being fair. Yasodha Maa advised Lord Krishna to apply colour on Radha and the other Gopis so that there would be no difference in anyone's complexion after that. On doing so Radha and the other Gopis playfully started beating up Lord Krishna with their Lathis. And thus, came the custom of applying colours and playing with lathis on the auspicious occasion of Holi. In Mathura and Vrindavan, Holi is celebrated for an entire week. Each temple hosts the event on a different day. People travel miles to witness and be a part of this Grand event. As per the customs set forward by Radha and Krishna, the guys playfully, yet decently apply colours on the ladies. The colours may include normal Gulal or gulal mixed with water. And the ladies, in turn, beat them with lathis, playfully of course. So, this one of the few places where Lathmar Holi is observed, where Holi is played with Lathis along with colours. Even some lathi competitions are held here. This is what attracts tourists from places. There are many other forms of Holi observed here. It would be a shame to miss the Holi procession while being there for Holi. You should first start with Vrindavan then visit Mathura. There is a procession which starts at VishramGhat and ends at Holi Gate. In this procession, around ten vehicles are brought down on the road. These vehicles are decorated with beautiful flowers and other stuff. In these vehicles, some kids are present. These kids are dressed as Radha and Krishna and they are paraded across the city from VishramGhat to Holi Gate. Around 3 PM this procession is at its peak. If you visit there at this time, you will be drenched in colourful waters and will enjoy to the fullest. Vrindavan is the place where Sri Krishna had spent his youth and it is the very place where his love bloomed. The Banke-Bihari temple is a place to visit for Holi celebration in Vrindavan. Here the idol of Bihariji, another name for Lord Krishna is made to be dressed up in white clothes. Then the idol is brought to the devotees. 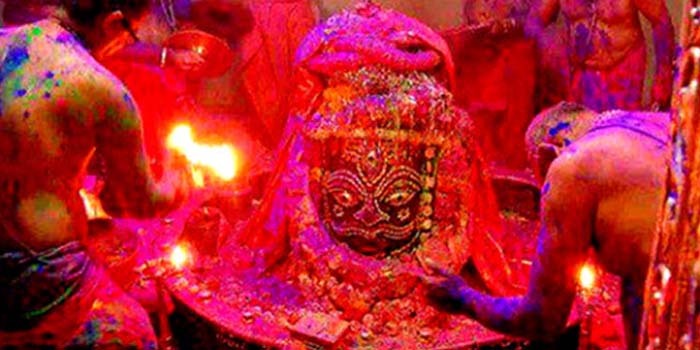 They apply colour to the idol as a part of the celebration. Goswamis are the common temple priests here. As a form of a ritual, these priests sprinkle gulal water on the devotees in water guns or pour the water from buckets. Devotional music is played, and people dance to its rhythm, play Holi and enjoy their time profoundly. In these two places, the Lathmar Holi is celebrated in full swing. People come from different parts of the world to witness this spectacular event. The playful atmosphere surrounding the colouring of women and after that women, in turn, using lathis on men set a celebratory joyful tone to the environment. The Lathmar Holi is also observed in Krishna's birthplace, Mathura. Here the celebrations are presented in a plethora of colours in Banke Bihari Temple in Vrindavan. This is celebrated in Vrindavan. Here along with traditional colours, colourful flower petals are also used to celebrate the festival and spread joy. People rejoice amongst the colourful flowers as they are showered upon. Widows are generally asked to avoid colours are celebrations as per the Indian Customs. But here in Mathura, a special Holi is solely organized for them. In widow's holi they gather and apply colours on each other. This is one of the prominent events as those people who suffered great loss, deserve some joy and happiness in life. It occurs everywhere in Brijmandal. This festival is sometimes observed by the priests crossing a holy fire in the village of Phalen in Kosi, Mathura. Apart from that, the biggest effigy is also burned in the Holi Ghat. There are so many other festivities are followed in Mathura apart from the traditional colouring of people. No, wonder it becomes the most attracted tourist sport during this time. Here in the temples of Mathura and Vrindavan, this holi is celebrated using coloured water. This Holi is another famous form celebrated in the Baldeo region of Mathura. There is a temple here in the name of Dauji temple where celebrations take place. This event marks the end of the Holi festival. It is celebrated in a grand way in the temples of Braj Mandal. 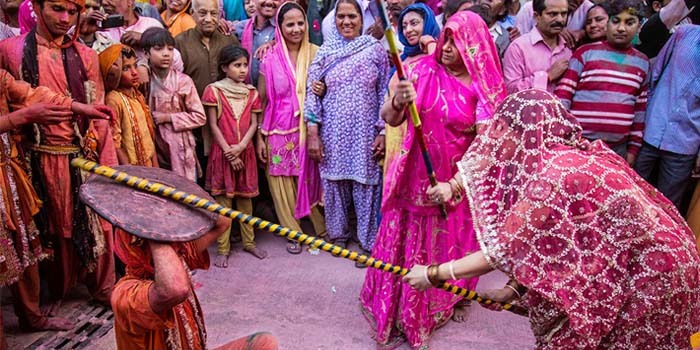 So, you can see the celebrations of Holi in Mathura and Vrindavan is unparallel to any other in the world. Holi is such an auspicious festival where people actually "play" with colours. They forget the woes of their common day to day life and rejoice in the festive mood. They add colours to their own lives and to the life of others. In Mathura and Vrindavan this festival is celebrated in a way that is one step above from the rest of India. To experience the real traditional Holi, one must spend the festival in these two cities at least once in their lifetime.